Check out the motorcycle Highway Code for motorbikes, scooters, and moped. The motorbike Highway Code also governs safety helmet use in the United Kingdom. The wording of the highways code makes it clear to identify the law when riding a motorbike. The words 'MUST' and 'MUST NOT' are the rules that need obeying. HIGHWAY CODE FOR MOTORCYCLES: This guide explains and clarifies the law for carrying pillion passengers on UK roads. It includes the guidelines for riding on the roads in daylight and in the dark at night time. Rules 83 to Highway Code rule 88 are for motorcyclists and riders of a scooter or moped. Motorbike rules on equipment help other motorists see you when you ride your bike. Rule 83: On all motorcycle journeys the rider and pillion passenger on a motorcycle, scooter, or moped MUST wear a protective helmet. But, there is an exception to Highway Code rule 83. It does not apply to followers of the Sikh religion if they wear a turban on a motorcycle. All motorbike helmets MUST comply with the Highway Code regulations. That means they MUST be securely fastened on your head. The UK's Motor Cycles Protective Helmets Regulations 1998 provides further rulings for motorbike headgear. Motorcyclists should check their helmet visor is clean. It should also be in good condition before setting off on a journey. Note: Legislation differs according to the quad bikes law for use on private roads. But, riders and passengers of motor tricycles and quadricycles should wear a protective helmet on any public road. Rule 84: Motorcycle riders are also advised to wear eye protectors. But, the eyewear MUST comply with the Code Regulations. Scratched or poor fitting eye protectors can limit your view. This is more likely when riding in bright sunshine or in the hours of darkness. Riders might also consider wearing ear protection, strong boots, and motorbike gloves. Extra safety clothing may help protect their body if they get involved in a collision. Rule 85: Motorcyclists MUST NOT carry more than one pillion passenger. The passenger MUST sit astride the machine and on a proper seat. Passengers should face forward with both feet placed securely on the footrests. You MUST NOT carry a pillion passenger unless your motorcycle is specifically designed to do so. The Highway Code for motorbikes also states that provisional licence holders MUST NOT carry a pillion passenger on a motorcycle. Rule 86: UK motorbike laws inform you to make yourself as visible as possible when you are daylight riding on a motorcycle. This includes being seen from the side as well as from the front and rear. Wearing a light or brightly coloured helmet, fluorescent clothing, or reflective strips will help you get seen by other road users. Riding with dipped headlights may also make you more conspicuous even in good daylight. Even so, be aware that other vehicle drivers may still not have seen you. They may find it difficult to judge your distance or speed. Note: This is especially so when using road junctions and riding near to road exits. Rule 87: Wear reflective clothing or strips to improve your visibility when riding in the dark. They will reflect light from the headlamps of other vehicles. That helps to make riders more visible from a longer distance. Rule 88: Maneuvering on a motorcycle requires extra caution. You should be aware of what is behind and to the sides before making any maneuver. Look behind you and use the bike's mirrors (if fitted). Always look out for pedestrians crossing the road and walking near parked cars. They may cross between stationary vehicles. Use extra caution as vehicles emerge from junctions or change lanes when you are situated in traffic queues. Position yourself and the motorcycle so that drivers in front of your bike can see you in their mirrors. Use extra caution and keep your speed low when motorcycle filtering in slow-moving traffic. What is the Motorcycle Helmet Law UK? When riding a motorcycle or moped on the road it is compulsory for all motorcyclists to wear a safety helmet. The regulations governing the UK motorcycle helmet law first became compulsory in 1973. There is a difference between a motorbike and a moped (or scooter). UK law states you must be 16 years or older to operate a motorized scooter. You should also carry a valid driver's licence or an instruction permit. Note that you will also need a Class M2 or M1 license to ride a moped if it can reach 30 mph. What is a Pillion Passenger? Broadly an English term, the word 'pillion' means a secondary seat, or padded cushion positioned at the rear of the main seat of a bicycle, moped, or motorcycle (or saddle on a horse). You would be considered to be riding as a pillion passenger if you are sat in this section of the seat. Can You Carry a Passenger on a Moped? You can ride and carry a passenger on a 50cc moped scooter if you have a full car licence (passed pre-2001). 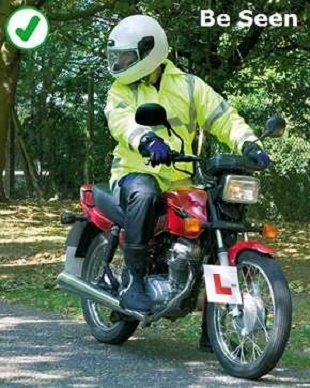 No extra test or training (C.B.T) is required and displaying 'L' plates is not obligatory. The 'compulsory basic training' test is needed if you passed post-2001. How Old Do You Have to be to Ride on the Back of a Motorbike in the UK? Under the UK Highway Code, pillion passengers must be able to reach motorcycle foot pegs comfortably to ride on the back. It is legal to raise and adjust the foot-peg mounting points to assist a small child. A rider younger than 17 years must have the youngster's parent or guardian's consent to carry them as a passenger on the motorcycle.